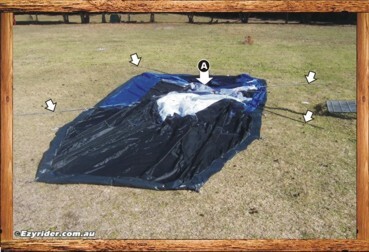 ﻿ Erecting Oztrail Tent - Pictures with Step by Step Guide. 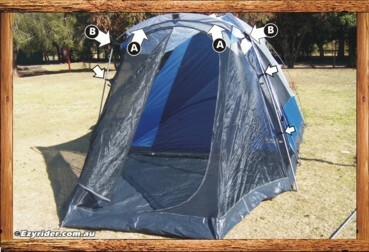 The following is a picture guide of how to erect this tent. 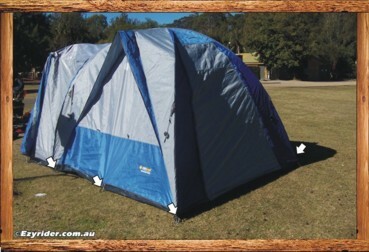 Check to see there are no sharp rocks etc on the ground and lay the tent out with the front facing in the direction you select. The black area is the front with the blue area the back. 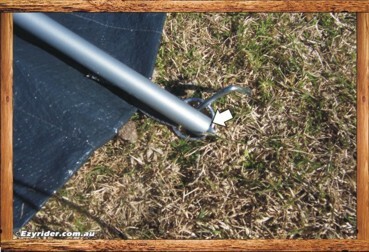 Peg the tent down all round but not completely in the ground. The climate control cover is hooking in before finally hammering in to ground level. 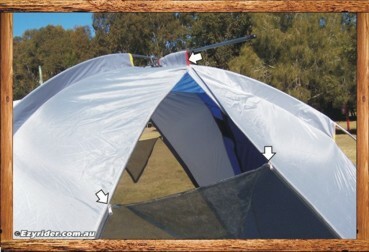 Left pic: The support rods and stitched area on the tent are colour coded. Slide the 2 yellow support rods through the stitched holding area (A). Right pic: (Y) indicates the yellow stitched area to slide the rods through. (R) indicates the awning rod which is red. Don't put this one in yet. 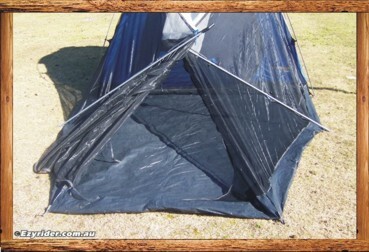 Take out the kinks in the stitched areas (Y) to avoid a major tie up when attaching the rods to the tent pegs to lift the wall and roof area. You probably won't get them all out, and will have to fix this as you kink up the rods to an oval shape. 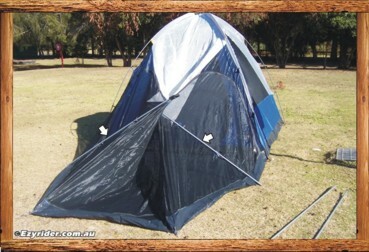 Then slide the tent across the rods evenly. Left pic shows the yellow tape on the rod and also slid into the pin support at the peg area. Right pic shows how the stitched area around the rods area evened out without kinks. Place one end of the support rod in the peg as per left photo, grab the other end and bend it up to an oval shape, sliding out any kinks in the stitched area and insert it into the other pin diagonally across and hold it in place. Sounds easy but its a juggling act as you have to hold it in place, grab the remaining rod, which is dangling around somewhere. Grab the end, put it in the pin area, while holding the first rod, hold both, bend the second one in an oval shape and insert it into the other pin diagonally across. It'll stand up now and you can take out, or level out any other kinks in the stitched area, as shown in the pic on right. The front area is colour coded also and has two support rods larger in diameter than the rear rods with a roof support rod the same diameter as the rear rods. Firstly, unzip the front area as you will need to walk into this floor area. 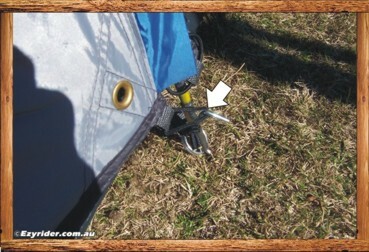 The left pic shows the rods in place after attaching to the tent 'hooks' stitched into the tent. The right pic shows the rod inserted into the pin. Insert both on each side. 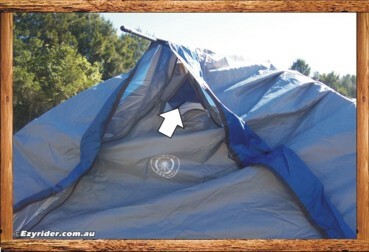 The left pic shows the assembly that is stitched to the tent at (A) and on the left how the rod is inserted into the assembly area. The arrows on the right shows where the roof support rod is inserted. There are two assembles on each side. 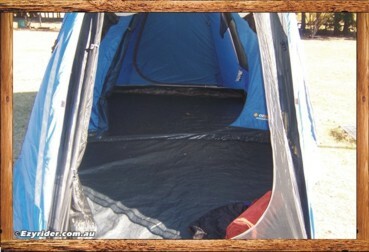 The right pic shows the front of the tent unzipped ready for walking in to attached the roof support rod. 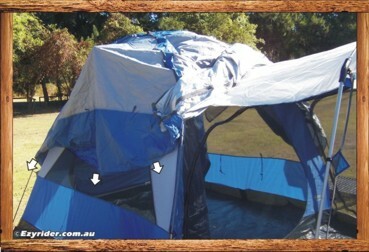 Slide the roof rod through the stitched area on the tent and the left pic shows the roof rod in place. Its a tight stretched fit so once you insert it into the assembly on the left, bend it up to an oval shape and insert it into the assembly on the right. 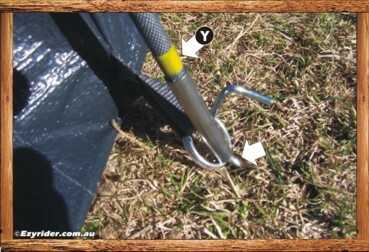 (B) shows the plastic assembly unit, (A) shows the rod through the tent stitched area, and the arrows at both sides shows the 'hooks' clasped to the rod supports. The right pic shows how to place your 'red' rod for the awning support at the reat. 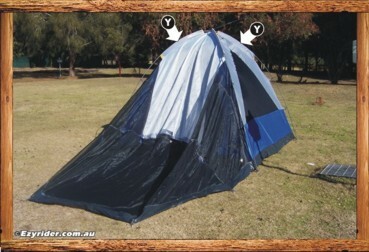 Get inside the tent, open the top area of the windows. 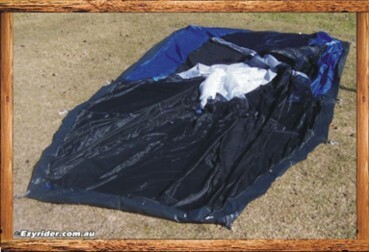 Outside, slide the rod into one side of the stitched area as per pic. 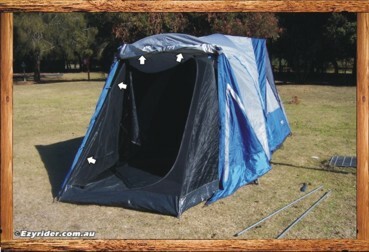 Back inside the tent and put one hand through the window on the right and one through the left. With the right hand push the rod to the left and use the left hand to slide it through the 'red' stitched area on the left. Even it out and allz-ok now for the climate control cover. 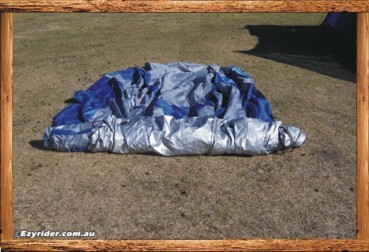 Lay the climate control cover on the ground with the blue area to the rear - pic on the left. There is also an OzTrail logo on one side of this rear area. Checking closer you will find the 'eaves' of the two side rear windows in this back section also, with 'climate control' logos just below them. 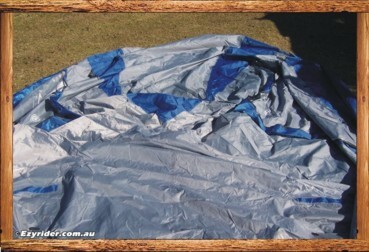 Pic right: roll up the cover to the blue area. 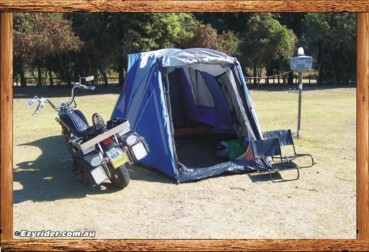 Left pic: Throw the cover over the tent so the rolled area is about in the middle and rear area drapes over the back area. 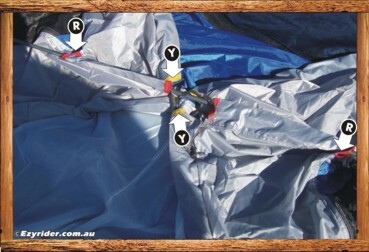 If it is windy you need to be quick while you pull down the back area (arrows) and hook the ends into the tent pegs on the ground, as shown in the pic on the right. Hook them in all around the back area to avoid a 'blow-over'. Now you can unroll it to the front and continue attaching it to the pegs on both sides towards the front. 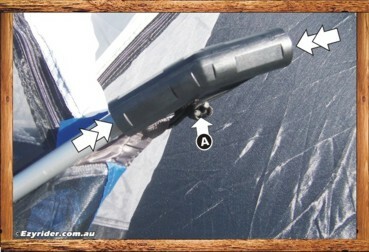 Left pic shows the arrows where the climate control cover is attached to the peg areas. The right pic shows the printed logo and where you will open the top part of the window cover to adjust out the awning area that sits on the awning rods. The left pic shows how you can roll up the top portion of the front area of the climate control cover and hold it in place with the hooks and straps attached to the tent. The left arrows shows how the front 'screen' area is rolled up and attached in a similar way to the side. 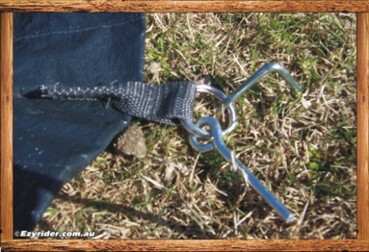 There are an array of hooks and ties and attachments on this tent. Just work it out your own way of how they will suit your needs. 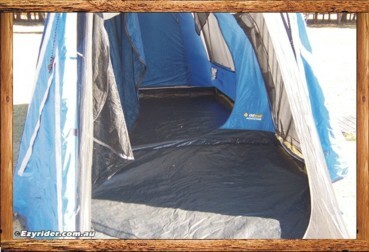 These two pics show the interior of the tent. There are two compartments that can be isolated with a zipped door. (This is the middle area where you run your power cord under) For a couple or single traveller there is more than enough room at the back for a double bed plus storage area and the area at the front is the same size for all your other gear. 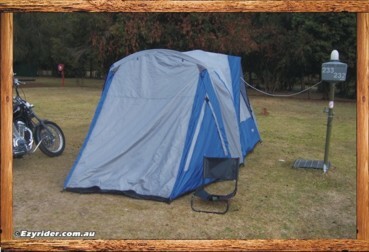 So when it's all set up you have a pretty tidy camping unit with room to move, an area for cooking and storage, seating inside or outside and enjoying the view to the area it faces. You can have the power cord through the top window area or the bottom area, where I tend to prefer. 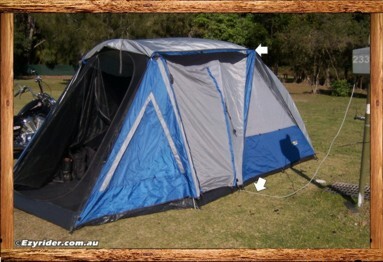 It only takes about 15 minutes to erect the main part of the tent. The left pic. 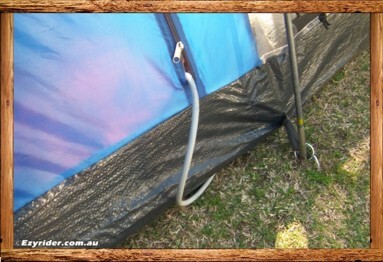 shows the power cord running under the tent and the right pic. shows the insert zip area on the other side. Left pic - a better alternative to hold up the climate control front door area. Attach the elastic loops onto the roof assembly rods. Loaded up with all the gear. 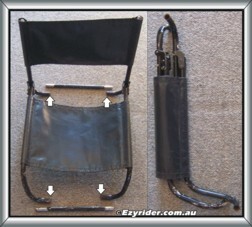 The arrow indicates one side of a twin back pack (saddle bag) assembly that hangs over the seat. 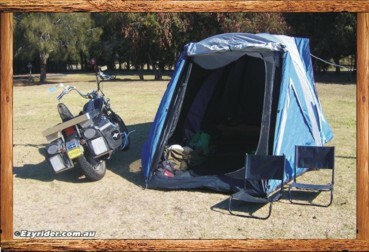 These provided more packing space and kept the load/weight ratio close to ground level. A chair is handy and this is one way of modifying a chair to carry on the bike. Cut off the main legs as shown at the arrows, cut a female version SHS to fit inside the male main support legs, slide them in and allz-aok. 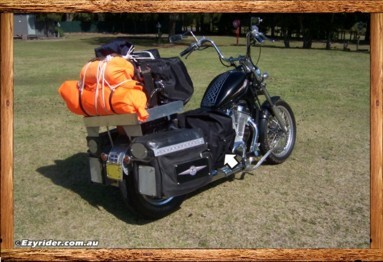 Fold it up with the cut off portions and it fits onto the rear section of my cruiser rack.